Accurately diagnosing autism can be tricky. The most reliable approach — in which clinicians assess a child’s behavior along with information from parents and clinical history — is intensive and time-consuming. Clinicians rely on different tools, such as the Autism Diagnostic Observation Schedule (ADOS) and the Autism Diagnostic Interview-Revised (ADI-R), to help diagnose the disorder. However, both of these tests, which are considered gold-standard tools, require significant clinical expertise. Researchers are continually trying to develop tests that are faster and require less training, but it’s not yet clear that this can be done without sacrificing accuracy. A new study, published 16 January in European Child & Adolescent Psychiatry, systematically reviews the various tools available for autism diagnosis and confirms that the ADOS and ADI-R are the most reliable. These two have the highest sensitivity and specificity, meaning they can accurately detect who has autism and distinguish the disorder from other conditions. Their reliability is also supported by more evidence than is available for any other test, according to the review. 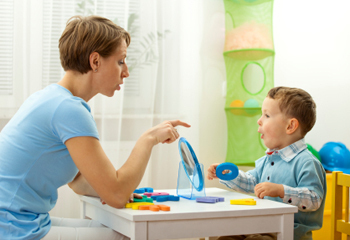 The researchers analyzed papers published from January 2000 to January 2012 on the diagnosis of autism and related disorders. They focused specifically on studies that compared a specific diagnostic tool with the reference standard — defined as a clinical diagnosis made by a multidisciplinary team. They also included studies in which participants were diagnosed both with the diagnostic tools under study, as well as with a gold-standard diagnostic test. Of the 68 studies that met these criteria, 24 assessed the ADOS, 23 the ADI-R, 11 the ADOS and ADI-R together, and 41 assessed 18 other tools. The researchers looked at a number of factors for each test, including whether different clinicians give similar scores on a given test and whether a particular individual receives similar scores when tested again using the same test. They then determined a measure known as the ‘classification rate’ for the various tests. Diagnosis by a multidisciplinary team has a classification rate of about 90 percent for autism, for example, and 80 percent for the broader autism spectrum disorders. With this method, the ADOS and ADI-R together have a classification rate of 88 percent for autism in children under age 3, and 84 percent for those older than 3. The Childhood Autism Rating Scale (CARS), a brief and simple test, also stood out, with a 90 percent rate. But CARS is typically based on an extensive evaluation that includes the ADOS, ADI-R, parent reports, language and motor tests and other assessments, the researchers note, and may not be as reliable in isolation. A number of other tools showed promise, but there are not enough data to support their use. Some tests have only been evaluated by the team that created them, for example. Notably, the researchers say that none of the studies in their review “could be classified as high quality.” That influences their ability to make definitive conclusions about any of the diagnostic tests. They note that it is especially difficult to assess the stability of a diagnostic tool, because an individual’s symptoms may change as a result of therapy or aging.